LARGE QUANTITIES OF MIXED IRONING? 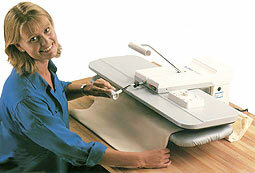 THE BLANCA PRESS IS YOUR EASY, AFFORDABLE ANSWER! As a business you can't afford to waste time, effort or money. Trouble is, that's exactly what you are doing if you're still ironing your laundry workload by hand like this! So simple to use on everything from trousers to shirts or blouses, Blancapress will zip through any garment in half the time. 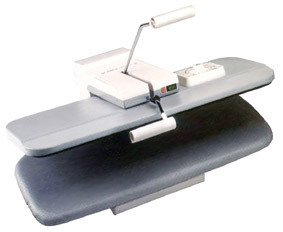 The Blancapress stands years of hard continuous use. INTRODUCING THE BLANCA PRESS - SAVE TIME, EFFORT & MONEY! One of the most advanced, reliable and economical presses you can buy, the Blancapress will enable you to breeze through any kind of garment or flat item you have with ease AND WHILE YOU'RE SITTING DOWN!  Your sheets can be folded and ironed up to four layers at a time, tablecloths and napkins the same, plus shirts, sirts, trousers and blouses can be pressed in half the time of normal hand ironing!  Safe, simple and sturdy, the Blanca press is designed for years of continuous hard use.  It's easy to clean thanks to it's Teflon casted heating plate and apart from occasionally changing the cover, it's virtually maintenance free!  The Blancapress is the only mid size press on the market capable of doing all this and is ideal for guesthouses, small hotels, restaurants, residential and nursing homes, small laundries, dry cleaners - in fact the list is endless!  Complete with a comprehensive 12 month parts and labour warranty and a 10 year spares availability guarantee, the Blancapress comes with complete peace of mind too.